It’s about time I continued working on my backlog of reviews. First, a PR representative for Green & Black’s kindly sent the lovely Classic Collection of miniature chocolate bars. The first thing that popped into my head when I saw the tiny bars was that they would be a great size for an American Girl doll (my favorite childhood toy). Maybe that's why I still think miniatures are so fun! 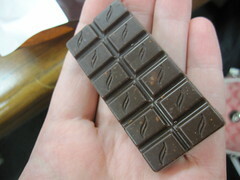 The cutest thing about the bars was that they were perforated, just like a full size bar! Adorable. The perforations worked, too, which is always a plus! 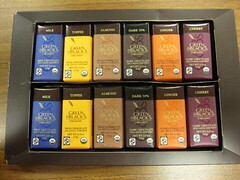 The collection includes six varieties: Milk, 70% Cocoa, Ginger, Cherry, Almond, and Toffee. There were two bars of each kind, so I recruited my husband as a guest taster and have included some of his comments below. I should also mention that, to quote the press email, Green & Black's sources high-quality organic and fair trade certified ingredients for all of its bars, and that this collection will be available for $9.99 in US major retailers starting in September. Even though it's a standard flavor, Milk was not my favorite of the set. It's really just my personal preference (which is typically > 60% cocoa or bust). It was very sweet and milky with a sticky melt (which is what my husband likes about milk chocolate). I detected a hint of what almost seemed like mintiness, but it could have been my imagination. However, when the milk chocolate was combined with Toffee, I loved it. 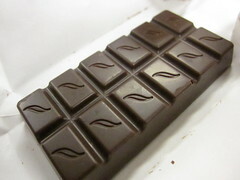 The bar had a nutty, caramelized flavor that went very well with the sweet milk chocolate. The chewy, slight crunch of the toffee was just right (Heath bars are too hard for me). The finish was very sweet, but it went well with the subtly salty toffee. 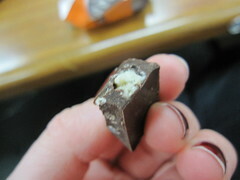 The Almond bar smelled milky, and the chocolate was soft and sticky. the almond pieces had a tender texture with a slightly crunch coating. The flavors mixed well, and it had a well balanced sweetness. But you know I was waiting for those dark bars. The Dark 70% bar had a satisfying snap and a nice, sweet start. The middle was fruity and slightly bitter, with the bitterness in the forefront on the finish. It had a lovely smooth melt and hints of toasty marshmallow flavor. It was never too bitter or too sweet, making it a fine specimen of dark chocolate. I'd be tempted to buy this bar alone in full size if I had a dark chocolate craving. 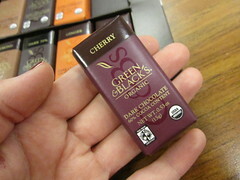 Cherry consisted of dried cherries in dark chocolate, and I was immediately stuck by just how sour the cherries were. My husband and I both love sour cherries, but neither of us were crazy about them here. The cherries struck me as especially tangy against the dark chocolate, and I might have liked it better with a sweeter chocolate to counteract the sour. It might have been because of the small size, because I noticed bites that had more chocolate than cherry were much better. Finally, the Ginger bar was a standout for both myself and my husband. It totally hit the spot. 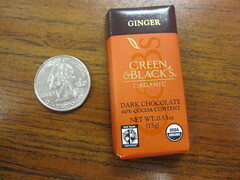 The 60% cocoa went very well with the sharp and noticeable (but not too strong) ginger pieces. The bar was clean, refreshing, and unique. The ginger added a tasty crunch and spicy flavor without a sinus-clearing burn. I could definitely see this as a great dessert after a pungent meal. Green & Black's Classic Collection has a lot to offer, with the Toffee, 70% Cocoa, and Ginger bars standing out in particular. While I wasn't crazy about the Cherry, I did appreciate its boldness, and it was really only the Milk that didn't excite me. The Classic Collection felt fresh, and tasting the set was a very enjoyable experience. Product was submitted for review by a PR representative. No compensation was received and the product was reviewed just like any other. I'm drawn to the toffee as well. I like the mini-format, but I wish the box had a few more of their exciting flavors. I guess they were going for classic, but the Milk and Almond don't really do anything for me, either.